When you are in the middle of a command and you need to snap to something that is not currently set in your running OSNAPs, you can use a temporary OSNAP override that will let you snap to the desired OSNAP and only that OSNAP and afterwards, it will turn off. This is helpful so that you don’t end up with too many OSNAPs turned on and it will let ignore your running OSNAPs and focus only on the needed OSNAP. 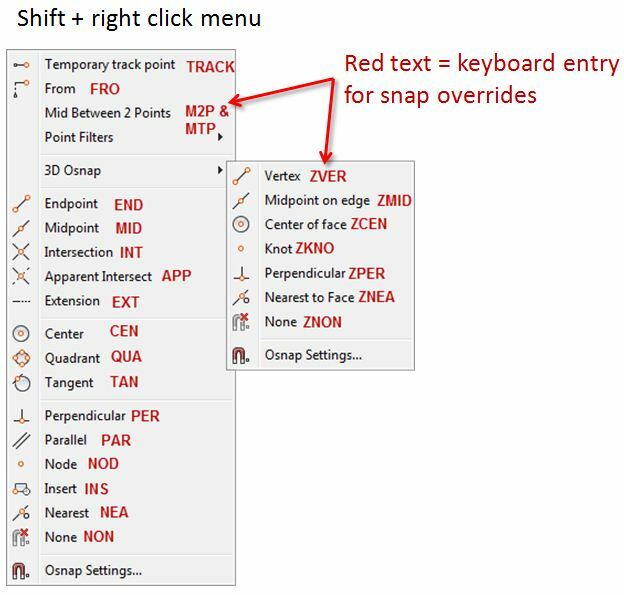 You can access these temporary OSNAPs while in the middle of the command by holding down the SHIFT button and then right clicking and then selecting the desired OSNAP or you can use the 3-digit keyboard shortcut (the 3D keyboard shortcuts are 4 digits). The keyboard shortcuts are illustrated in the image below as red text. This entry was posted in 3D Intro, BASICS, New in 2011, Settling In, TIPS. Bookmark the permalink. AutoCAD knowledge necessary to add a lot of references. try to visit my blog AutoCAD tutorial simple.